Examples on factors on different types of questions on factors are discussed here step-by-step. 1. Find all the factors of 42. 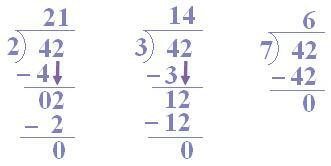 According to properties of factors, 1 and 42 are the factors of 42. Now we find the numbers which completely divide 42. By dividing the numbers we find the factors of 42. Thus, 1, 2, 3, 7 are complete dividers. 2 x 3 = 6; 3 x 7 = 21; 2 x 7 = 14; are also divisors. Hence, 1, 2, 3, 6, 7, 14, 21 and 42 are the factors of 42. (ii) 7 is a factor of 84. 74 is not divisible by 9. So, 9 is not a factor of 74. 84 is divisible by 7. So, 7 is a factor of 84. Students can practice these examples on factors which are discussed here step-by-step.